I’m kind of tired of working by myself. I’m just not smart or creative enough to create an entirely inquiry-based curriculum. You know, the kind of curriculum where you pose an interesting problem to your students and let them attempt to solve the problem, and the teacher becomes more of a facilitator and intervenes, when necessary, rather than up-front, all the time. On the other hand, I’ve “e-met” a lot of super smart and creative teachers online. Either through twitter or by following their blogs, there are a ton of great math teachers across the country that pose interesting, engaging problems to their students. But we (or at least, I) have a hard time aggregating these awesome exercises or problems into a year’s worth of curriculum. So that’s what I’m going to try to do – and I’d like your help. There are open google documents with a fairly representative set of curriculum standards on the left. I’m looking for potential ideas on the right. The ideas may be fully-developed as lessons, or just ideas in their most nascent form. If you know of (or have written) a blog post that addresses a certain mathematical concept, share the link so we can all take a look. The teachers I talk to aren’t looking for a canned curriculum. They are not looking for pre-printed lessons that are plug-and-play. They are simply looking for ideas for problems. Does a certain math concept have any real world relevance or a potentially engaging way of presenting the concept? Have you run an interesting activity or posed an interesting problem dealing with transformations of the absolute value function? Have you found a novel way to have students explore parabolas? Or quadratics? Let’s stop working separately and start aggregating some of the amazing work you are doing in your classrooms. 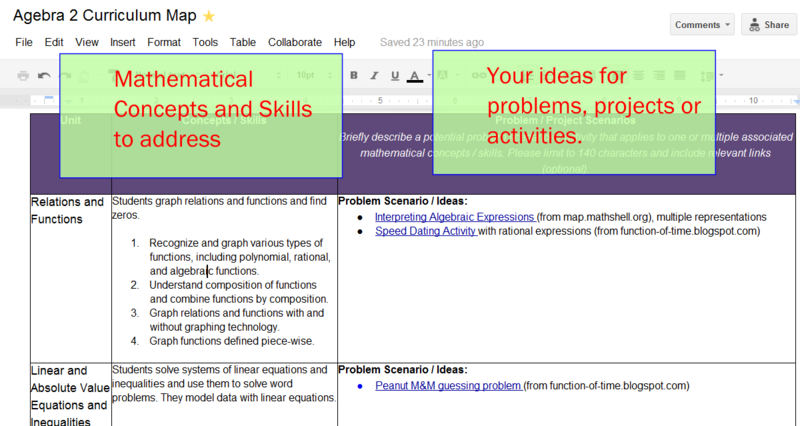 As of today, the Google Doc Curriculum Maps are open for business, awaiting your input. My hope is that it will be as helpful to you as you are to it. Because, for the life of me, I have no idea on an engaging way to teach “know the basic trigonometric identity cos^2 x + sin^2 x = 1.” But I know some of you do. Just posted this on Twitter to help spread the question and challenge around. Thanks for help spreading the word! Looks like a good way to collect stuff. I’ve wanted to do something like this. I don’t have time to add much now, but I did link to my murder mystery in the precalc log section. If you mention this in December, I might be able to do lots more. I just added several links to the Algebra curriculum and one to the Geometry curriculum. Great idea. I have been hoping something like this got put together. don’t like to do it.